Germany, Part 1. Germany, Part 2. This is a fine example of Adam and Charles Black's 1851 map of Germany in two parts. The map covers all of Germany from Denmark to Switzerland and depicts individual German states. 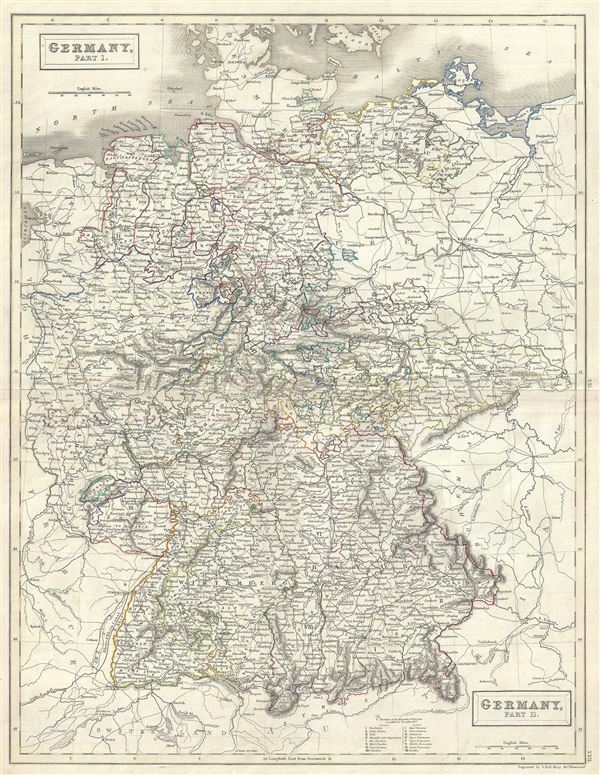 The map also notes the 'Divisions of the Kingdom of Bavaria as settled in November 1837.' Throughout, various cities, towns, rivers, lakes, roadways and an assortment of additional topographical details are noted. After the defeat of Napoleon, the Congress of Vienna created The German Confederation to coordinate the economies of these separate but culturally related German-speaking countries. The Confederation acted as a buffer zone between Austria and Prussia, the two largest and most powerful member states. In 1848 the March Revolution swept through Europe, in particular Germany. These Revolutions were nationalist pro-German, pan-German, declarations of discontent with the archaic autocratic political structure that dated to the 39 original German states established under the Holy Roman Empire. The years following the violent suppression of the March Revolution saw a vast middle class exodus from the German states to the United States, leading to 'Germantown USA,' and popular interest among Americans in the Fatherland. The map is engraved by S. Hall and issued as plate nos. XXI and XXII in Black's General Atlas. Rumsey 2305.028 (1854 edition). Philips (atlases) 4334.